Home Snowboard & Ski Goggles RayZor Black Framed Goggles With an Anti Fog Red Iridium Mirrored Vented Double Lens. 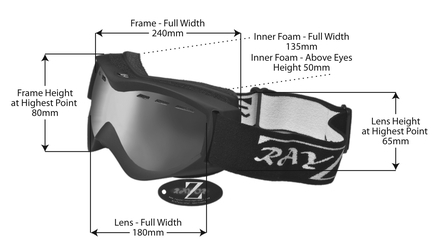 RayZor Black Framed Goggles With an Anti Fog Red Iridium Mirrored Vented Double Lens. UV400 Red Iridium Mirrored Anti Glare, Vented Spherical, Wide Vision Clarity Lens. The RayZor Red Iridium Mirrored Sports Lens Offers Enhanced Vision and Sharpness By Reducing The Snow Glare On the Slopes.